When you live in a close rural community, not only do you have close friends, but unfortunately, you also see some of them pass on. It was such with our friend, Jerry Yourczek our neighbor, who died at 92 years of age. David began working for him, farming and haying just before my husband, Bob, died in 2005. David enjoyed many years of work with this wise old mentor and also learned much about repairing machinery and life. Jerry, a Navy veteran of both WWII and Korea, was very active all his life, and was a much appreciated and entertaining member of the community. We’ll miss him greatly. 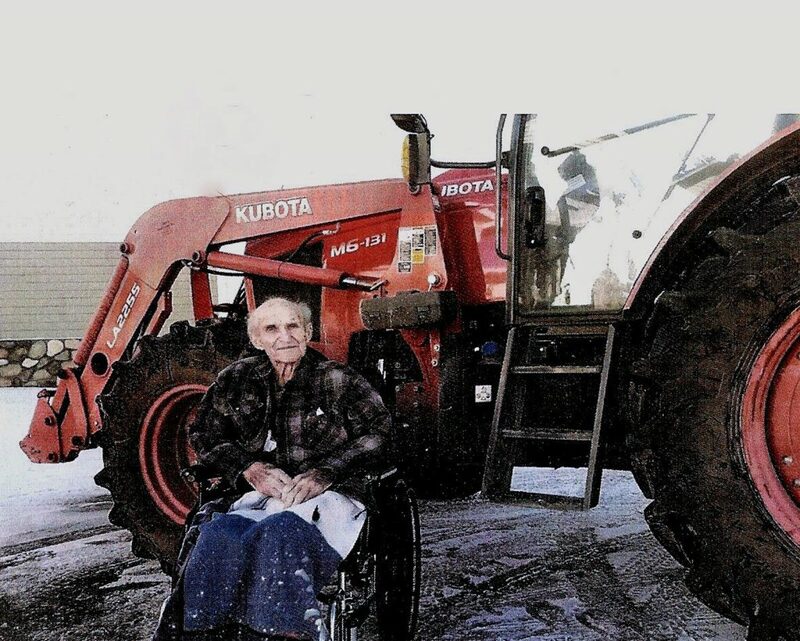 While Jerry was in a local assisted living home, the company he’d bought his tractors and other equipment from, Lulich Implement in Wisconsin, brought a flatbed trailer down, loaded Jerry’s beloved Kubota tractor on it and drove to the home. There, they unloaded it and the folks got a nice photo of Jerry in a wheelchair, sitting by his tractor. Very nice! I had to laugh at a saying, printed on his obituary: “Life’s journey is not to arrive at the grave in a well-preserved body, but rather to skid in sideways totally worn out, shouting “holy cow … what a ride!” That described Jerry to a T! He farmed up until this winter. Our late friend, Jerry Yourczek with his favorite tractor. Yesterday, David and Ashley gave me a ride down to his brother, Bill’s, to pick up the Ford Escape we were buying from him. Our Subarus have both given up the ghost and we needed a cheaper-on-gas vehicle than the 3/4 ton truck. I got home with no problem. Then, overnight, we had a foot of new snow and when I went to move the car, it wouldn’t start! I tried everything and probably frustrated Bill by calling and asking for possible glitches I was making. (The car is smarter than I am, I’m sure!) No dice. But then Will got through plowing snow and came to the rescue. It was just a stuck starter solenoid and needed a tap. Ah! Ignition! Whew. Tomorrow I’m getting out the planting containers and Pro-Mix soil as in a week I’ll be starting the first peppers and petunias. See? Spring is coming … sooner or later. How soon should I start my seeds if I won’t have a outdoor greenhouse or hoop to put my grown plants in? I plant directly in the ground in the open garden. My Indiana garden gets planted mid May. Wishing you and your family good tidings. So very sorry to hear of MrJerry’s passing. So many of your articles have mentioned him over the years. David going to work for him. Him loaning you things etc. May he rest in a peace well deserved for such a nice neighbor. My sympathies to you all. Sad for you at the loss of a dear friend. Glad that you have wonderful memories. We should all hope to leave behind people who will miss us. That’s so very true, Wendy. I’m so sorry to hear about the passing of your dear friend. Seems we’ve reached a time in life when it is no longer rare. I miss them all–there’s no one to replace their wisdom. Thank you Wanda. Yes, that’s sure true. But something we all must face at one time or another. Planted onions this morning. Harvested and weeded my peas and tomatoes. Weeded arugula and carrots. Beets are finally up. May God bless you all through this difficult time. You admiration for your neighbor is so heartfelt. My sympathies to all his family and friends. Thank you Sue. Jerry was, indeed, much loved through his life. Luckily, his family has abundant support due to it. What a life well lived! And many friends! To have even a glimmer of his life would be a blessing. May peace and joy fill you as you reminisce over the memories of Jerry. It would take pages and pages to even mention all the wonderful things Jerry did and accomplished during his life. He was truly a unique human being. My condolences to you, your neighbor’s family, and your community. Thank you Jeanne. We all appreciate your thought. Sorry to hear it! Jackie, my husband and I started following you back in 2006 and I have all your books. Sorry to say, he passed away 6 weeks ago at 63 after fighting a hard fight. I picked upyour book, Starting over again last week and so many similar situations we went thru! May you have many memories of your friend! I’m so sorry for your loss. It’s a really, really hard thing to go through. Yes, we’ll always have many memories of Jerry.